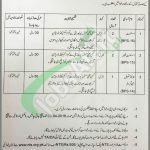 Tap this page for Auqaf Department KPK Jobs 2018 Application Form Download - nts.org.pk. Office of Administrator Auqaf KPK Province invites applications from the KPK domiciled male & female candidates who possess qualification and experience for the vacant positions such as (Assistant (BPS-16), Assistant Manager (BPS-15), Junior Scale Stenographer (BPS-14)). Appointment of above-mentioned positions will be on contract basis and duration of the contract is extendable on satisfactory performance of an individual. Candidates wanted to apply for these jobs should possess qualification and experience as per the criteria mentioned in the following image posted image and criteria can also be examined from the following heading. For Assistant, Graduation 2nd Division from HEC recognized university is required and preference shall be given to those candidates having a grip on Accounts Manager and on Computer applications. For Assistant Manager, minimum Graduation 2nd Division from a recognized university is required and those who had computer knowledge will be preferred most. For Junior Scale Stenographer, minimum Second Division Graduation with Shorthand Diploma holders are eligible to apply. Filled-up application form along with originally paid deposit slip of Rs. 500/- as test fee and all required documents should reach the following address. All applications should reach National Testing Service Plot # 96, Street # 4, H-8/1, Islamabad. NTS fee can be submitted to any online branch of HBL, MCB, ABL and UBL Bank (non-refundable and non-transferrable). The last date for submission of application is April 03, 2018. Information about Roll Number & NTS test date and timing will be dispatched to the official site of NTS before one week of NTS test. Last Date to Apply: April 03, 2018. Address: National Testing Service Plot # 96, Street # 4, H-8/1, Islamabad.